At LearningRx, we want to equip our franchisees with the tools and knowledge they need to help students of all ages succeed inside and outside the classroom. Through our brain training programs, students can improve their cognitive skills such as attention, memory, and logic and reasoning. Our learning centers are designed to provide one-on-one instruction where the same brain trainer works with the same student on a regular basis. One of the best ways a student can become a better learner is to know how to ask the right questions. If they don’t understand something in an assignment or during a presentation, students may raise their hands and say, “I don’t understand,” instead of asking a question that can provide the teacher with insight on exactly what it is they don’t comprehend. Instead of repeating themselves or getting frustrated, teachers can take a different approach and perhaps explain the problem or topic in a different way. A primary goal of every LearningRx location is to provide a safe space where students can learn and grow. We also want it to be a safe space to ask questions about things that students don’t understand. Unlike traditional tutoring that focuses on one subject or preparing for a test, we want students to use more of their brains and develop stronger cognitive skills. 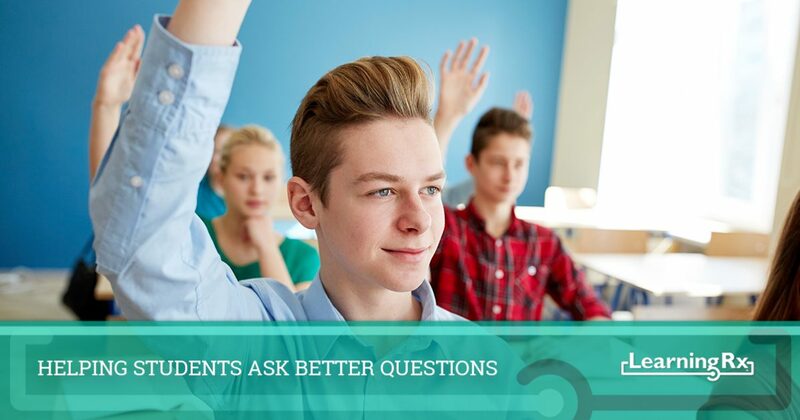 As they encounter new problems, students will be able to recall the information they’ve already learned and ask specific questions to find the answers to those new problems. When they feel safe, they’ll feel more inclined to voice those questions to their brain trainer. If you’ve ever been a teacher, then you may heard some off-the-wall questions during class. While these situations can create valuable teaching opportunities, they can also derail your train of thought or cause the other students to become distracted. However, thinking outside the box can often help students arrive at the answer they need, even if it’s not in the way you intended. By encouraging this type of thinking, you’ll help students come up with questions that you may not have thought of yourself, and they’ll be engaging parts of their brain that help them arrive at the proper conclusion. As a teacher or trainer, you’re the one setting the example for the students with whom you work. They’ll look to you for guidance, and they’ll possibly mimic how they ask questions on how you do. If you ask more than one question at a time, they may ask more than one at a time. If you ask leading questions that don’t leave room for an answer, other than the one that’s implied, they may do the same, which can lead to discouragement and frustration. By watching how you ask questions and modeling better ways to search for answers, you can provide a positive example for your students. If you’d like to know more about our brain training programs and educational franchise opportunities, please contact us today. We’re always excited to meet new people and to see if they’re a good fit for our franchise model.